What is the Park Prescription movement? The national Park Prescription movement encourages health care providers to prescribe spending time in nature. Known as “ParkRx,” the initiative urges everyone to see outdoor activity as an important contributor to good health. It also strengthens the ties between the health care system and public lands. The goal is to increase outdoor physical activity to prevent (or treat) the health problems that result from inactivity. Learn more at http://www.parkrx.org. What is Park Rx Day? Park Rx Day is the last Sunday of National Park Week in April. Health care providers, local leaders and environmental and community organizations organize the day’s events in outdoor spaces. Activities across the U.S. include fitness classes, health screenings, guided walks and park clean-ups. 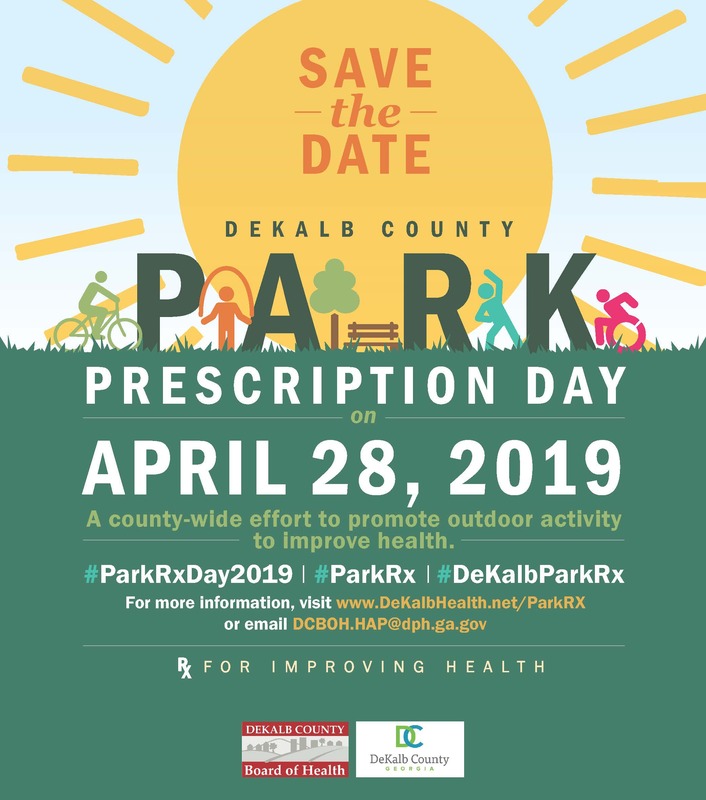 What will happen in DeKalb County on DeKalb county park Rx Day, Sunday, April 28? The DeKalb County Board of Health is coordinating the county’s observance of Park Rx Day. A planning committee of representatives from government, non-profit and community organizations and county residents is organizing the 2019 DeKalb County ParkRx Day celebration. Park Prescription Day is a national day of activities taking place in parks and green spaces around the country. Park Prescription is a growing movement of prescribing nature to improve health. Using parks reduces stress, improves mental wellness, encourages physical activity and encourages healthier lifestyles. Park Prescription Day Sunday, April 28, 2019. All DeKalb County Park Prescription events are free and open to the public. Planned activities include yoga, tai chi, guided walking tours, blood pressure screenings, health education and food demonstrations. Vendors will offer giveaways. Activities: Yoga, cardio, guided walking tour, kid-focused fitness, health education and more! 1775 Ponce de Leon Ave.
1760 Masson Mill Rd., N.E. Partners: Centers for Disease Control and Prevention (through a Racial and Ethnic Approaches to Community Health grant); City of Decatur; DeKalb County Board of Health; DeKalb County Commissioners; DeKalb County Department of Recreation, Parks and Cultural Affairs; DeKalb County Public Library; Friends of Parks; GUIDE, Inc. (Gwinnett United in Drug Education); Kaiser Permanente; Live Healthy DeKalb Coalition; Park Pride; Pepsi-Cola Beverages; residents of DeKalb County; and Sagittal Soul Health and Fitness. For more information, call (404) 508-7847 email dcboh.hap@dph.ga.gov or visit www.DeKalbHealth.net/ParkRx.